Buying a luxury catamaran is an incredibly exciting experience, one in which you’ll want to use both the emotional and rational parts of your brain. First and foremost is the fun part. Imagine what type of experience you see yourself having on your future catamaran. Are the destinations you want to sail to close or farther afield? Who do you envision your trip being shared with? What type of integrated amenities are featured in the interior? Now that you have an overall picture of what type of luxury experience you are desiring it is time to step into the more rational side of the consideration process and take a look at the type of catamarans for sale. Below are some consideration points that will help you refine your search and distinguish what things are important to you personally. Are you looking for a power catamaran or sail catamaran? Both a power catamaran and a sail catamaran are excellent boats in their own right. The differences come in relation what kind of sailing experience you wish to have. If you are looking for a slower paced experience, where your holiday isn’t the destination but the journey a sail catamaran may be more suited. Particularly is you are wishing to go on longer trips. The reason being is they are usually designed with socialising and relaxation in mind. A power catamaran may be a better choice is your trips are shorter and require access to more built up areas. This is because they are more compact without the mast and therefore can pass under bridges more easily that sail catamarans. In addition, power catamarans generally speaking have better speed therefore is your desire is to jump in the boat on a long weekend and have an enjoyable short boating trip this may be your preferred mode of transport. Are you looking for a pre-owned or new catamaran? 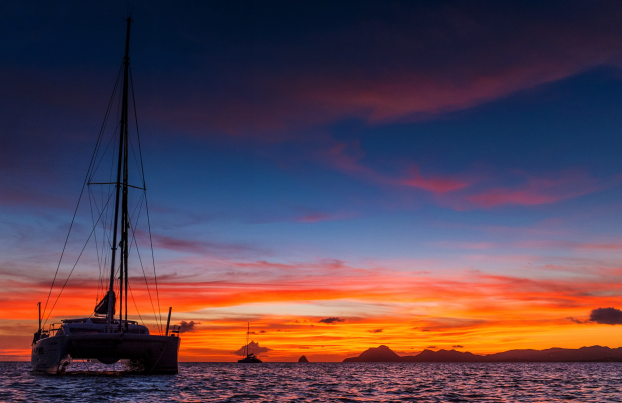 The next consideration is whether financially you can justify purchasing a catamaran new or whether a better option is to look for a used catamaran. Used catamarans can still have a great deal of luxury as a new catamaran without the huge price tag. Number of cabins, the amount of space available on the boat and amenities like number of toilets and air conditioning is a good place to start. Comfort and safety should be prioritised when comparing luxury catamarans. When considering this part of the consideration process it is a good idea to write a list of all the aspects you consider to be luxury on a catamaran and then look to prioritise this list in order of importance. By doing this it will enable you to consider whether the pre-owned catamarans on the market meet these needs or whether your only option is to buy new. Now the fundamentals pillars of the buying a catamaran are defined the next step is to get into the nitty gritty of boat buying. Setting up an excel spreadsheet will be best way to order and record the differences between catamarans on the market. Below are the types of things you should compare and feature on your spreadsheet. Noting that not all are relevant depending on whether you’re looking at a sail or power boat. Once you have diligently collected all the above information on your boats of choice, the next step is to compare and contrast. By going through this process it will allow the list to reduce naturally and give you more bargaining power when you finally negotiate between boats and sellers.